The front of this card looks conservative enough that you wouldn’t know it was sold in the decade when greeting cards went bonkers and beatniks and sputniks and all other kinds of alternative living spaces and lifestyles expressed themselves via them. 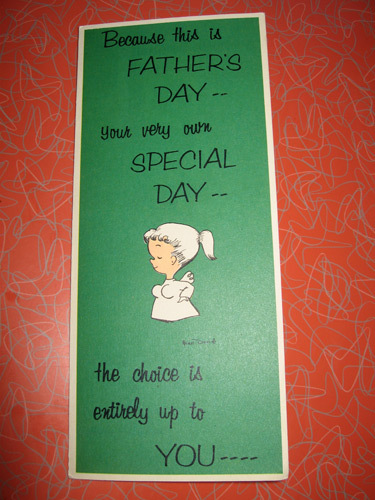 But when he opened it up Dad would have seen that this card was very much of its era given that the choice that the saccharine sweet angel tot offers her dad inside is one between TV dinners. Dad’s choices most likely would have been Swanson’s chicken and turkey or beef, all with vegetables swimming in a butter sea. 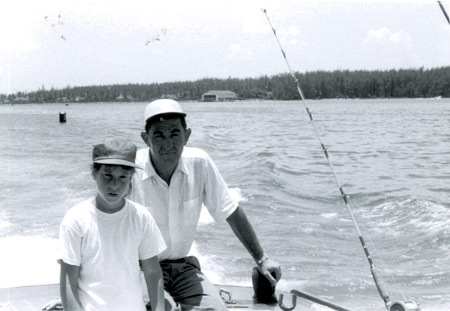 Here I am with my father Father’s Day, 1957, whipping back to shore to get ready for dinner. 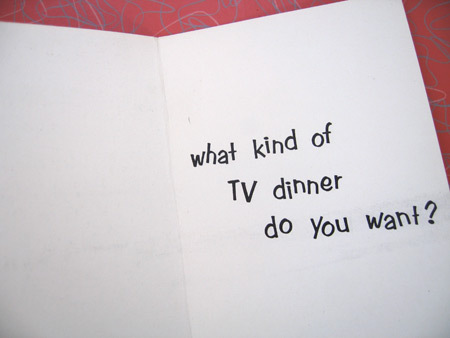 My mom cooked that night but I’m pretty sure my dad would have chosen the Salisbury Steak with gravy, whipped potatoes, peas in seasoned sauce and peach cake cobbler. After dinner, I’m pretty sure I used the aluminum tray to organize my marbles into teams for some sport I made up to play with my dad on his big day.